Bill Parcells is one of the more memorable coaches in NFL history. Not only was he an excellent orchestrator of coaches and evaluator of talent, he was quite the personality during press conferences. Bill Parcells was actually selected in the 7th Round of the 1964 NFL Draft by the Detroit Lions, but he was cut before he played a single game, so he almost immediately hopped into coaching (at Hastings) after graduating from Wichita State. He coached linebackers at Hastings, Wichita State and then later at Army before being promoted to defensive coordinator at Army in 1968. In 1970 he returned to coaching linebackers with Florida State, and the later Vanderbilt and Texas Tech, before taking his first head coaching job with Air Force in 1978. Parcells briefly took a job as the defensive coordinator for the Giants under Ray Perkins in ’79- but quit the job. He returned to coaching the following year as linebacker coach for the Patriots in 1980. It wasn’t that long thereafter before he returned to the Giants as their defensive coordinator and linebackers coach in 1981. He converted the defensive alignment to a 3-4 and succeeded Ray Perkins as HC in 1983. After a bumpy start and being on the hot seat, Parcells righted the ship and led the Giants back to the playoffs. In 1986 the Giants won their first Superbowl (XXI), as New York posted their best franchise record (14-2) led by their stellar defense and Phil Simms. 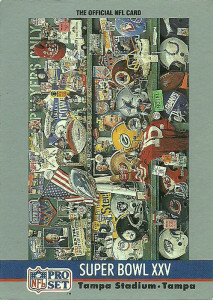 The NFC East at the time was the Dallas Cowboys, New York Giants, Philadelphia Eagles, the Cardinals, and the Washington Redskins. While the Cowboys were in a steep decline and the Cardinals were rarely a threat, the Giants had a rough and tumble time with both the Redskins and Eagles. It took another 4 years, but in 1990 the Giants returned to the Super Bowl (XXV) in a game considered to be one of the most exciting in NFL history. The Giants defeated the Buffalo Bills 20-19 led by stellar defensive play and a plodding offense that soaked up the clock led by grizzled veteran RB Ottis Anderson. Parcells retired after the game, citing health reasons. Briefly Bill did sportscasting with NBC from 1991-1992, but was chomping at the bit to return to the game. 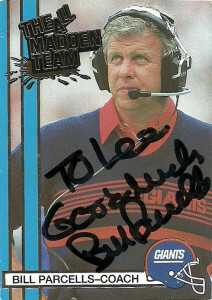 In this phase of his coaching career, Parcells became known as a rags to riches coach. He came in and immediately turned around the fortunes of the franchises he coached. It can be attributed to Parcells for fixing the Patriots, restoring the franchise to respectability, and beginning the dynasty that has lasted into today. He coached for the Patriots from 1993 to 1996, with the team appearing in Super Bowl XXI- a loss to the Green Bay Packers. The following season Bill joined the New York Jets thanks in part to disagreements with the Patriots owner Robert Kraft over front office decisions. The Jets had to pay the Patriots a king’s ransom in draft picks to get him in the end, but Bill proved to be worth the price, turning around the moribund Jets. (In 1998 the Jets finished with a 12-4 record but lost in the AFC Championship.) He retired again from coaching in 1999. Jerry Jones was desperate to fix the Dallas Cowboys who were beginning to become the laughing stock of the NFC East. Three consecutive 5-11 seasons were enough for Jones to approach Parcells hat in hand to lure him out of retirement. Bill’s price for Jones was steep: Head coach and general manager and no interference from Jones. The year was 2003. As with his previous stops, Bill had the magic touch leading the Cowboys to the playoffs, but over the next few years, he just couldn’t get Dallas over the hump. Before the 2007 season, Bill retired for the 3rd time. He briefly did studio analysis for ESPN, but was lured out of retirement for a 4th time by the Miami Dolphins into an executive role at the end of 2007. As in the past, Bill fixed the Dolphins, cutting fan favorites, signing stacks of cheap free agents, firing coaches, bringing back into the fold mercurial RB Ricky Williams, and Miami responded with an 11-5 record. He retired, presumably for a final time in 2010. 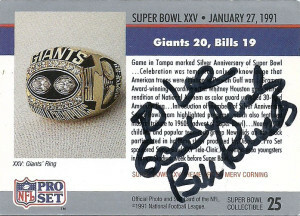 Bill has an extensive coaching tree, and was inducted into the Pro Football Hall of Fame in 2013. He lives in Florida and does some volunteer consulting from time to time. Currently he is retired… or is he mulling another comeback? *donation of $10 per flat. LeRoy Butler’s story is an inspiring and amazing tale, as he spent the early years of his childhood confined him to a wheelchair. As he recovered from his impairments, he got up, and never appeared to stop running. 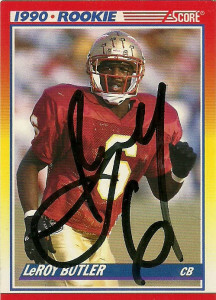 LeRoy was part of a devious secondary for the Florida State Seminoles playing alongside Deion Sanders and high school friend, – runningback Edgar Bennett. He’d replace Sanders in the lineup at cornerback, converting from Safety in 1989. A solid tackler with a good nose for the ball, Butler played well for the Seminoles that year, etching 7 picks and 94 tackles. His 139 return yards that year broke the record set by Sanders, while his 106 yards against Syracuse broke Sanders’ single game mark. LeRoy also spent time returning kicks, displaying his quickness and speed. He was also named first team All-American from both the AP and UPI in 1989. LeRoy finished his college career with 194 total tackles, 2 fumble recoveries, and 9 interceptions for 202 yards and 2 touchdowns. 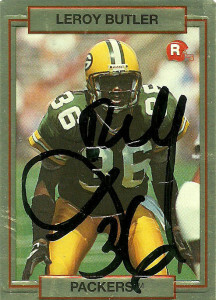 Green Bay selected LeRoy with their second round pick of the 1990 draft. Used sparingly his rookie season, Butler still managed 3 picks, 19 tackles, and a forced fumble. That was enough for the coaches to promote him to starter at right cornerback in 1991 and Butler turned in another 3 pick season. As the Packers continued to remake their secondary with the addition of Terrell Buckley in 1992, Butler moved to his native strong safety position. In the meantime the Packers also drafted Butler’s friend Edgar Bennett as well. It’s here that Butler enjoyed the best football of his career and perhaps for any safety in the league. 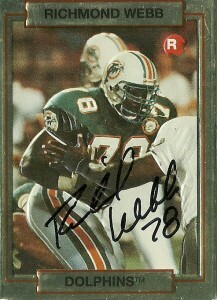 After a quiet ’92, LeRoy in 1993 had his first AP season, with 6 picks and 2 fumble recoveries. It’d be in this season that he’s best remembered for taking a lateral from teammate Reggie White (who was gassed) and ran a fumble 25 yards into the endzone. At the end of the play LeRoy jumped up into the stands, thereby creating what is known today as ‘The Lambeau Leap’. Butler continued to play the next 9 seasons in Green Bay winning Super Bowl XXXI earning AP honors in 1996, 1997, and 1998. During the 1996 season, LeRoy intercepted 2 passes and returned one of them 90 yards for a score against the San Diego Chargers. Butler suffered a separated shoulder during the 2001 season, ending his season after 9 games. Quietly though it also ended his career as during training camp the following season, it was discovered that it didn’t heal properly. Since then Butler has devoted himself to charitable activities and speaking engagements. A member of the NFL’s All-1990s team, the Green Bay Packers Hall of Fame, and the first defensive back to earn 20-20 club honors, the hope is as more defensive backs finally get some recognition from the NFL HoF, Butler will also get the honor he’s long deserved. 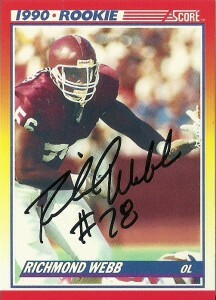 Richmond Webb was a dominating offensive lineman for the Texas A&M Aggies blocking for notable runningback Darren Lewis and quarterback Bucky Richardson. Quick for his 6’7″, 291 lb frame, Webb had been clocked at a 5.09 40 before the draft in 1990, and had seen time at defensive tackle and offensive guard, before assuming his duties at tackle in his senior season. He earned All-Southwest Conference Honors in both 1988 and 1989. With excellent arm extension, and the ability to pull or trap, Webb was coveted by many teams in the hours proceeding the draft. While Dan Marino had been sacked only 10 times in 318 attempts the previous season, the Dolphins felt that their anemic run game needed some help so with the 9th overall pick of the 1990 draft Miami selected Webb, -the highest rated offensive lineman on the board. The Dolphins then turned around in round two and selected Keith Sims to play guard, further insuring the integrity of the Dolphins line for the next ten years (-drawing some comparison to the duo of Mike Munchak and Bruce Matthews in Houston). Webb had a dominating rookie season and became the first rookie offensive lineman in the history of the franchise to be elected to the Pro Bowl. In fact, Webb’s performance was so dominant, he earned 1990 AFC Rookie of the Year Honors from the UPI and All Pro Honors. Over his career with the Dolphins Richmond earned AP honors in 5 seasons (1990, 1992, 1993, 1994, and 1995,) and Pro Bowl honors in 7 of them (from 1990-1996). He’d end up playing with the Dolphins through the 2000 season, transitioning from the Don Shula era, through the Jimmy Johnson years, and into the Dave Wannstedt seasons. He’d sign with the Bengals in 2001 but by then injuries began to take their toll on the big man and by 2002 he’d be done in by them. 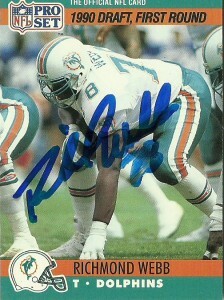 Still he attempted to comeback the following season with the Dolphins, but in the end retired. 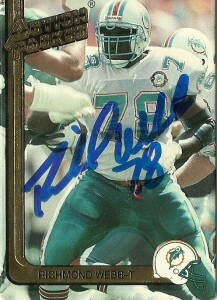 Richmond has been inducted into the NFL All 1990s decade team, and in 2006 was honored on the Dolphins Honor Roll for his efforts. At last glance, Webb is retired and living in the Dallas area. He’s dabbled with being an Houston Texans ambassador, and I recently caught up with him at Fan Fest 2013, where he was incredibly jovial and friendly. When he asked me what I wanted him to sign I said, “The sexiest offensive lineman alive?,” which got a great big laugh out of him. He also told me that current A&M quarterback Johnny Manzell, is the man, and can compete at the next level.